Known for a long beach run along Greenwich Bay and a rugged New England coastal landscape, the second and final day of racing at NBX Gran Prix of Cyclocross also featured umbrellas as part of the soggy landscape on Sunday. A weekend of racing at Goddard Memorial State Park in West Warwick, R.I. concluded with repeat wins by Cannondale presented by Cyclocrossworld.com teammates, Kaitlin Keough and Stephen Hyde. Winners of the Vittoria Northeast Cyclocross Series presented by Clif Bar and Cycle-Smart were crowned on Sunday in the elite races. Rebecca Fahringer (Kona Maxxis Shimano) would take the Verge Sport champion's jersey for women and Curtis White (Cannondale p/b cyclocrossworld.com) would earn the jersey and title for elite men. 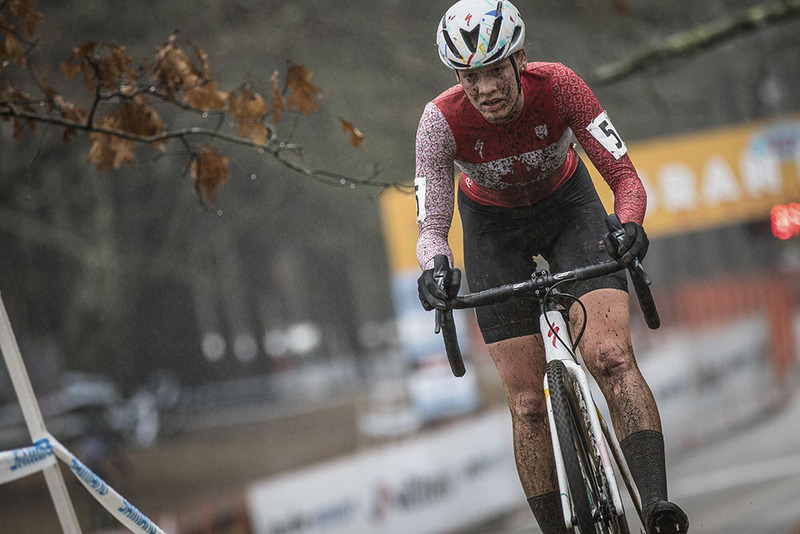 It was the 14th year of cyclocross races in Warwick, with elite races this weekend being part of the USA Cycling Pro Cyclocross Calendar (ProCX). Saturday featured UCI sanctioned Category 1 (C1) races. There is one more weekend of ProCX racing on the schedule, Dec. 10-11 in North Carolina and Oklahoma. Then athletes travel to Louisville, Ky. for the USA Cycling Cyclocross National Championships, Dec. 11-16. Sunday's C2 races in Rhode Island took place for the Elite Women in rainy conditions. While it was unusual for temperatures to rise throughout the 50-minute contest, from 50 degrees Fahrenheit to 55 degrees, it was business as usual for Keough to sizzle for a second consecutive day on the course. She would take the holeshot and keep contenders at bay for all five laps. The rain created havoc for most of the 37 women in the field, especially at the start before learning how to manage the new direction of the course and manage Mother Nature's challenges. On the first lap, Keough was followed by Regina Legge (Salem, N.H./Trek Cyclocross Collective) for part of the twists and turns, then joined at the front by Ruby West (Hamilton, Ont./Specialized-Tenspeed Hero). Legge would drop back to 10th after the first lap and West would also succumb to the mud and have to work her way back into contention for a podium finish. After the second lap, Keough had gained an 11-second advantage over West. There was more ground for Fahringer to cover, as she was on the ground with a fall, then worked into third place after two laps. With one lap to go, Keough had as much as 34 seconds on West. The young Canadian never relented, and pushed through the rain and mud. Keough did not make any noticeable mistakes, and carried the lead across the line for a win, 9 seconds ahead of West. Fahringer finished third, 1 minute, 42 seconds off the wining time. She earned enough points to take the Vittoria Series title for elite women. Rounding out the Top 5 for women were Magdeleine Vallieres (Quebecor-Stingray) and Crystal Anthony (Liv Cycling). Both were more than 2 minutes back. Legge did not finish. The rain stopped for the Elite Men's race, but left its mark. The course was very slippery, with mud covering roots and creating ruts. 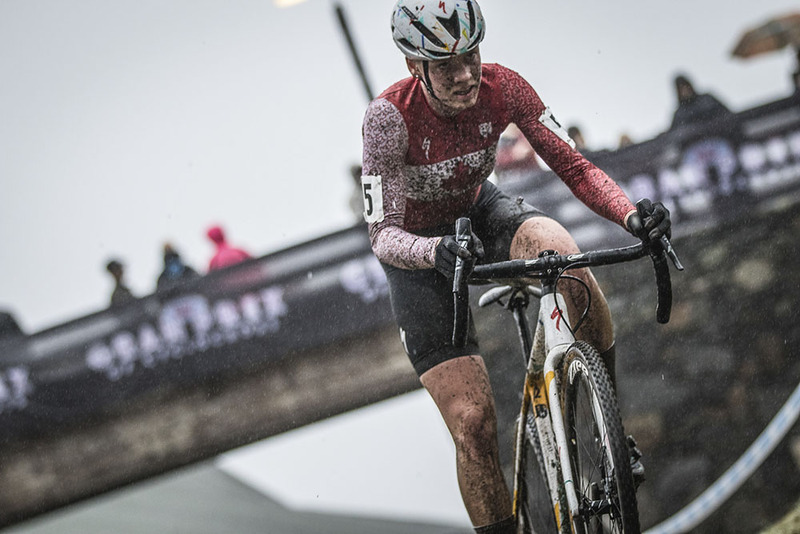 Hyde would take back-to-back wins at NBX Gran Prix of Cyclocross, but not without fighting off top contenders as well as the course. Forty-five men took the start line for seven laps of racing, led out by Jeremy Powers (Southampton, Mass./Pactimo / Fuji / SRAM) from the holeshot. Jostling at the front early would be Hyde, White and ProCX points leader Kerry Werner (Birdsboro, Penn./Kona Maxxis Shimano), with Powers dropping back a little and riding with Spencer Petrov (McKinney, Texas/Cannondale p/b cyclocrossworld.com). On the third lap, Hyde and Werner created separation from White, gaining a four-second advantage that would continue to grow with each lap. The duo of Powers and Petrov would linger about 15 seconds behind White for most of the race. Hyde would cross the line solo, covered in mud, in a time of 59 minutes, 49 seconds. Werner held on for second, finishing 28 seconds behind. In third rolled White, 57 seconds back. "Hyde and Kerry were riding really well today. I tried to stay with them, but I wasn't on the best form today. I don't think I recovered as well as I could have from yesterday. But one bad day out of the entire Series, I'm not too disappointed in the grand scheme of things,"said White, who led the Vittoria Series competition for elite men from start to finish in all eight events. Petrov and Powers would close to within 9 seconds of White with two laps to go, but not get any closer. Petrov would finish 16 seconds behind White for fourth place. He pushed across the line 10 seconds ahead of Powers, who would finish fifth. "It was a good, old-fashioned mudder today,"Werner added about the concluding race for the Vittoria Series. 1 Kaitlin Keough (USA) Cannondale Cyclocrossworld.com 0:49:56.